Auggie Talk: Tori Review: "Beneath The Surface"
We've got a Tori Review for you today! It's one she's been anxiously waiting to share with all of you. Enjoy! After deleting the first line of this review at least a dozen times, I have come to the conclusion that this is going to be one of the hardest reviews that I have ever written. How do you give proper justice to a something so poignant and haunting? I honestly don’t know, but I’m certainly going to try. I wanted to be a marine biologist and work with the most beautiful creatures I had ever seen. Only one teeny tiny problem…I was landlocked and roughly 600 miles separated me from the ocean. So the plotting began. I would save as much money as a little girl could manage delivering glasses of orange juice to the old farmers at the diner where my mother worked until I had enough change to go to SeaWorld. Mind you, I was paid a quarter a glass. So, as you can imagine, I thought it would take me no time at all before I would be able to sit in the stands and watch Willy (as they were all named in my head) and the trainers (that were akin to superheroes in my eyes) fly through the water. Now that I’ve explained the origin of my extreme love for cetaceans (a word I had to look up exactly how to pronounce), on to my review. After visiting SeaWorld in Orlando when he was six, John Hargrove was obsessed with becoming a trainer and I must say, I was quite impressed with his extreme level of dedication. From astronauts to fire fighters, we all know that career aspirations can change when reality intervenes. But Hargrove’s dream never wavered. He succeeded in becoming a SeaWorld trainer in Shamu Stadium, a coveted role among the facilities. If I wanted to see an orca, I could just buy a ticket, plop down in a stadium, watch these gigantic animals do tricks for fish, and then go home. But most people don’t think about what it takes to interact with these extremely intelligent creatures on a daily basis. It takes a man like Hargrove to give the world a glimpse into what happens when the show ends. After reading his descriptions of the aggression between the animals, their extreme boredom after being stuck in a box for most of their life, and the achingly sad recount of listening to mother, Kasatka, trying to find her daughter, Takara, after she was taken from her…it’s all devastatingly obvious that human-animal relationships need some serious work. 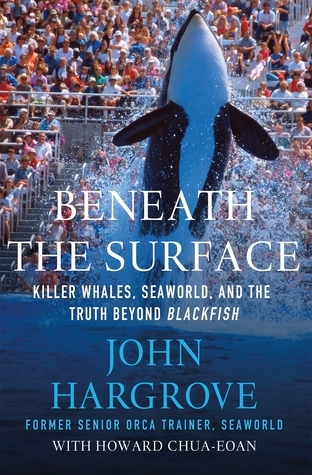 Over the past year, I have read everything I could find on the subject of animal captivity and I know that Hargrove has been judged quite harshly for speaking out against SeaWorld after having been a team player for so many years. On that argument, I will say that I can completely understand his plight. While I was not working with animals, I was a manager of a chain bookstore that had me spewing the company line for years. I remember arguing the benefits of online shopping at OUR site versus Amazon (which was a dirty word inside the franchise). Eventually, I finally stopped feeling like a team player. I stopped arguing that the pay scale was fair. I just stopped. It took me another year before I finally had to leave. I stayed for my co-workers whom I adored and the customers that showed up every morning without fail as soon as the doors opened. My point? No one can know how hard it is to love and train creatures as majestic and dangerous as orcas every single day and still have to accept the fact that they do NOT belong to you. They belong to a corporation that cares about profit. Not about how barbaric it is to kidnap whales from their pods, rip calves from their mothers, and shove them in a concrete box to be trapped like slaves for the rest of their lives. No one can truly understand this except the men, women, and orcas who have lived it. Stars and quills don’t seem to be enough to describe how ardently I believe that this book should be read by all. But as I must, 5 very determined quills to Beneath the Surface! To those of you wavering over your next read, pick this book. My heart is heavy and my mind is plagued with thoughts of creatures far far away, but I wouldn’t trade this knowledge for anything…big or small.